Here’s a cool idea for a cheap and easy Christmas or Valentine’s surprise. 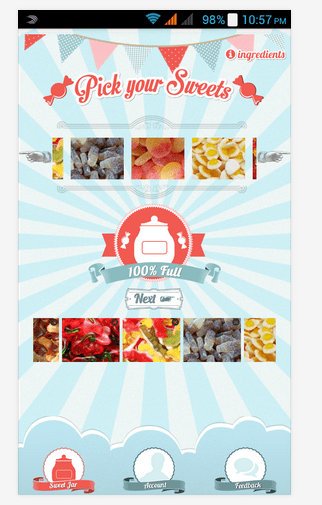 Sweet Jar, from the developer ByPost on Android, is a new app, released in early December. At time of writing it has less than 50 downloads and a handful of reviews but they’re all positive. The idea behind the app is simple – choose your favourite sweets, drop them in the jar, personalise the message, pay, provide a delivery address, sit back and wait until your little jar arrives. The sweets are mainly Haribo style gummy retro classics such as fried eggs, fizzy cola bottles and friendship rings although chocolate raisins also appear on the publicity shots on the Google Play site. This is a sweet little app (sorry about the pun!) which I can see teen sweethearts using as a quick and easy way to surprise their partner. It’s also a gloriously retro way for the older generation to rekindle the old fashioned pick’n’mix era. The app is very simple to use, simply hit the ‘Go’ button on the initial start right now screen and the app will scroll forward to the next page. There you pick your choice of sweets by dragging and dropping your six choices into the jar in the middle of the screen. The lid will lift as you deposit each one, and a message ‘100% full’ will appear when the maximum number of sweets for that jar has been reached. On the next screen you have a chance to personalise your jar’s message in a little over 90 characters. It’s not enough to write anything too complicated but easily long enough to wish someone happy birthday or tell them you’re thinking of them. Payment uses ‘credits’ but monetary payment is effected through PayPal. You provide a delivery address and a few days later your little Sweet Jar will arrive, neatly packaged in a box, with a selection of sweets in it for you or whoever you asked for it to be sent to. Sweet Jar is both retro and modern at the same time. It’s also one of the few apps which allows your digital life to interact seamlessly with real life. Sure, there are shopping apps out there, but this is subtly different and quirky. Shopping apps have real shops that you can go into and browse before ordering online. This has no real shop; it’s a fun app that then turns into a physical product. Sweet Jar may have found a real niche market here – a fun and casual way to tell someone you thought of them. The 21st century version of a card and a box of chocolates, perhaps? I look forward to seeing what developments are to come with this unusual app – will it diversify its range or increase the size of the jars, maybe. If you download it today, you can be among the first to know. Image of Sweet Jar screenshot taken from the Google Play site and used with developer’s permission. Previous story MorphCostumes just upgraded your Christmas Jumper!